You may not be able to visit a garden centre, but Lilac Nurseries and the Norfolk Olive Tree Company are selling the most wonderful selection of plants. Deepdale Café offers excellent cake, teas and coffees, so you won’t be missing those. Then there are stalls offering homewares, jewellery, accessories, art, photography, toys, and much more. Don’t forget there is also chocolate, that staple of Easter, hand crafted and seriously delicious from So Sweet. Other Norfolk food producers will tempt your taste buds too, including Marsh Pig and Candi’s Chutney. We’re pleased to say that the weather forecast for Burnham Deepdale on Easter Sunday is improving all the time, and the majority of the stalls are in a large marquee or by a covered walkway. So you can enjoy your visit to Dalegate Market whatever the weather back at home. 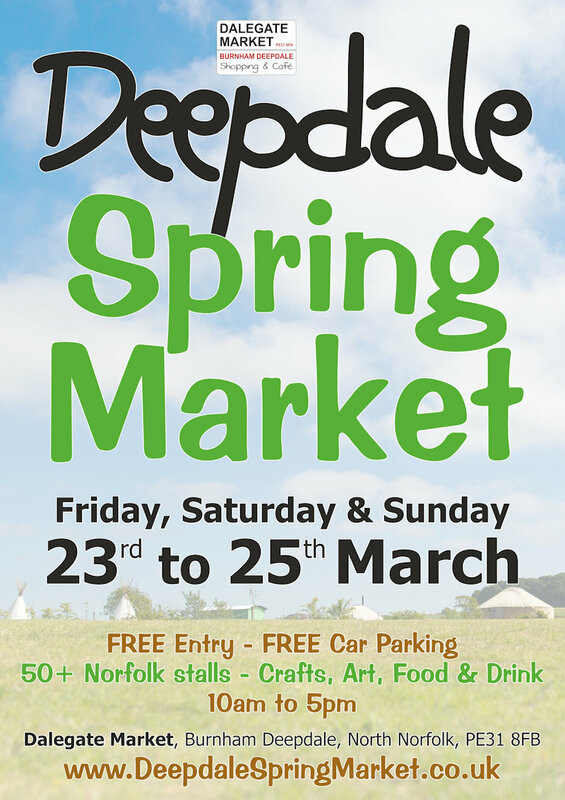 It’s FREE to visit the Deepdale Spring Market, and there is plenty of car parking around the site and in field car parks, signposted from the A149 coast road. Take the chance to enjoy the fresh air, big skies, Norfolk artisans and ‘Not on the Highstreet’ independent shopping on the North Norfolk Coast at the Deepdale Spring Market, open both Sunday 27th and Monday 28th March from 10am to 5pm.